Newcastle-upon-Tyne, strangely enough, lays claim to the first ever organised dog show. This distant forerunner of Crufts predates its famous successor by around thirty years, and took place at the Old Town Hall / New Corn Exchange building at the foot of the Bigg Market on 28th and 29th June 1859. The building is now long gone. This Exhibition took place in the New Corn Market on Wednesday and Thursday last. The new feature of the addition of Sporting Dogs to the show of Poultry was a great attraction, and tended in no slight degree to the success of the meeting. The arrangements were admirably carried out: litters, with proper divisions, round three sides of the spacious building were set apart for the dogs, which were chained and sufficiently protected by barriers from any chance of injuring or alarming the visitors; and in this section the prizes given, two valuable guns, from the manufactory of Mr. Pape, gunmaker, of this town, were probably a sufficient inducement to produce twenty-three entries for Pointers and thirty-seven for Setters, many being from different parts of the kingdom. Among them were some very splendid specimens of their kinds; and certainly on no former occasion was ever witnessed in this town so novel and, to sportsmen, such an interesting exhibition. And it may be remarked, as creditable to the breeders of Sporting Dogs in this district, that the palm for the best Setter was carried off by William Jobling, of Morpeth, that for Pointers being gained by J. Brailsford, Knowsley, Lancashire. Then; were many others which were highly commended by the judges for symmetry of shape and purity of breed, as will be noticed in the judges’ decisions, who, it is presumed, in giving their decisions as to which is the best dog, could only certify to shape, symmetry, and apparent purity of breed; for although a dog may possess all these points, he may not, for want of proper training, scent, or other defects, be the best in the field for the sportsman. There is no indication that the event translated into an annual affair in Newcastle, but later that same year another show was organised in Birmingham – which itself became a fixture in the calendar. And thence the craze spread worldwide. But it all began in Newcastle. 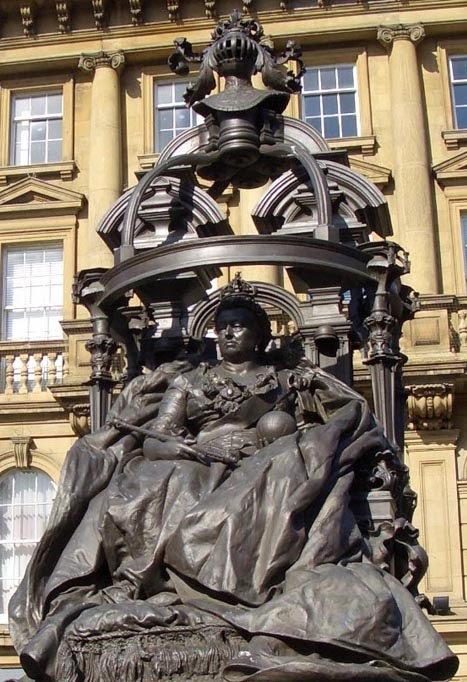 In the little public square a few yards to the north of Newcastle’s St.Nicholas’ Cathedral sits an often overlooked bronze statue of Queen Victoria. The monarch sits amidst ornamental splendour facing west, so as not to turn her back to either the cathedral itself or the old Town Hall which used to be situated a few yards further north at the foot of the Bigg Market. The controversial monument – often criticised for its ‘over-the-top’ embellishments – is the work of sculptor Sir Alfred Gilbert and was unveiled in 1903. It was a gift to the city from Sir William Haswell Stephenson, a company director and politician who was Newcastle’s mayor a total of seven times, and was intended to commemorate 500 years of the Shrievalty (the jurisdiction of a sheriff) of Newcastle. The 500th anniversary itself was actually in April 1900 and, as we all know, Queen Victoria died in 1901. The slight delay in the statue’s unveiling was down to some temporary cash-flow problems for the said Stephenson. As for the fanciful design, the artist was, it seems, attempting to echo the architecture of the nearby cathedral. Sculptor Alfred Gilbert is also responsible for a similar statue of the old queen in the Great Hall at Winchester (but without the fancy canopy), and also designed Eros (or, more properly, Anteros) of Piccadilly Circus fame. The Newcastle commission must, however, have been one of his last in the UK, as he slipped into bankruptcy and began an extended exile in Bruges in 1901. Now cruelly hemmed in by motorway madness and the seventies creation that is the Pilgrim Street Roundabout, the building known universally as the Holy Jesus Hospital sits cheek-by-jowl with all that is bad with the modern-day city. This curious structure is difficult to find. Like the centre of a maze, you know it exists – and may even be able to see it – but actually reaching it across/under/over the myriad of pathways and underpasses is no mean feat. When you finally get there you may wonder how it escaped demolition at all. Though most of the present-day building was thrown up in the 1680s, masonry survives from the old Augustinian Friary which occupied the site from the thirteenth century. In time, the old structure found royal favour – though the Dissolution of the Monastaries eventually put an end to that friendly arrangement. 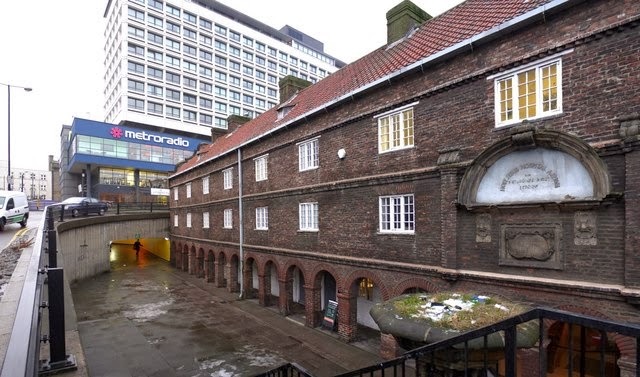 It still retained a certain air of importance – including acting as a back-up venue for the Council of the North in the mid- to late-sixteenth century – but eventually fell into disrepair. Passing out of private ownership and into that of the town corporation, the present ‘hospital’ structure was built during 1681-83 to house retired freemen and their kin. It was (is) built of brick – a fairly new-fangled material at the time of its construction. Amazingly it remained in use as an almshouse until 1937. The famous ‘Soup Kitchen’ was added in 1880, and served the ‘deserving poor’ for a decade or so. Though the hospital carried on, the various other buildings on the site were used by a variety of private enterprises during the early twentieth century. By 1960, though, the place was a mess. Whilst all around the hospital was demolished and roads driven hither and thither, the old building somehow escaped the bulldozers and even enjoyed a revamp – re-opening as the John George Joicey Museum in 1970, focussing on the history of the city. Its hopeless situate, however, meant it was little visited and it eventually closed in 1993. A further renovation saw the building re-open yet again in 2004 – this time as the local HQ of the National Trust’s Inner City Project. It seems, though, that this latest phase in the history of the Holy Jesus Hospital building is set to end soon – and the future remains uncertain. Arms : Gules three Castles triple towered Argent (Red shield, three triple-towered silver castles). Crest : On a Wreath of the Colours a Castle as in the Arms issuant therefrom a demi Lion guardant supporting a Flagstaff Or flying therefrom a forked Pennon of the Arms of Saint George (On a wreath of the same colours, a castle – as in the Arms – issues therefrom, from which a golden lion supports a forked flag of St.George). Supporters : On either side a Sea Horse proper crined and finned Or (On either side stand sea-horses, trimmed in gold). The arms were granted in 1575 (though were in use unofficially from the 1300s), but were not confirmed until as late as 1954 by the College of Arms. 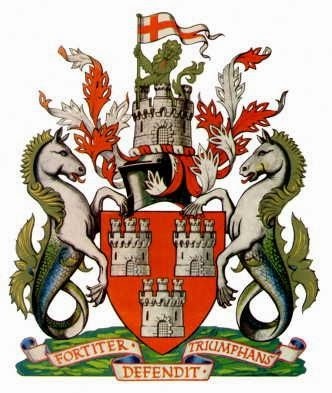 The oldest part of the coat of arms, the triple-castled shield, goes back to earliest times – the town taking its name from the "New Castle" built by order of Robert Curthose, eldest son of William the Conqueror, in 1080. The earliest surviving example of the three silver castles on a red shield, dating from about 1400, is in the window on the north side of the Chancel of St. John’s church. In the crest, added later, the castle motif is repeated; and the lion’s forepaws grasp the flag of St. George. The castle stands upon a wreath of red and white above a tilting helmet, with eye slit of fifteenth century style. The supporters, mythical sea-horses, shaded in green with gold manes, fins and tails, are a reminder that Newcastle is a seaport. Both the supporters and crest were added to the shield by grant of William Flower, Norroy King of Arms, dated 16th August 1575. The motto, Fortiter Defendit Triumphans (‘Triumphing by Brave Defence’) was adopted during the English Civil War following the stubborn (but ultimately unsuccessful) defence of the town against the Scots in 1644.